Bottom Sticky Music Player WordPress Plugin can add sticky music player at the bottom of any WordPress site. You will be able to add music playlist within your posts or pages just by clicking a button and select/upload your music files. The bottom sticky music player is completely responsive. 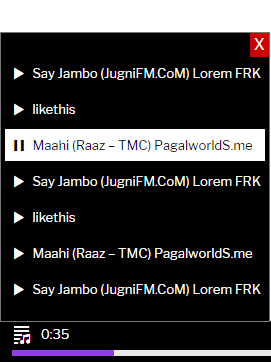 Add music playlist by clicking and selecting/uploading multiples music files. Audio controllers like control volume, forward, backward. Audio controllers can be work by keyboard keys. This features can be disabled. Unlimited color combination options available to choose. You can choose the color for each component from the color picker tool. Options to choose the color for the player background, font, player bar, volume bar, volume icon. Click the volume bar to set the volume anywhere. Supports MP3 type audio files. Easy to add the player in post and pages. In order to add the playlist, you just have to click the button, select or upload one or multiple MP3 files and put it. When you visit the post or page, you will able to see the player. Below is how users can control the music player by pressing keys from your keyboard. space key: play or pause the playing music on the player. right arrow key: forward the playing music. left arrow key: backward the playing music. up arrow key: increase the volume of the music. down arrow key: decrease the volume of the music. I hope you have got some idea about the WordPress Bottom Sticky Music Player Plugin. If you like this plugin, then you can get it from CodeCanyon.